My goal is to start each child on their musical journey with joy and to instill in them a life-long desire to continue their musical studies. I like to show my students the math patterns in music and tell them stories about the great composers and the history of music in order to connect the universal themes that are present in music and extend around the world. As my students grow musically, I believe they can use this knowledge throughout their lives. Deanna's love of music and the piano has been constant since childhood. She has been fortunate to study with Tamriko Siprashvili for the past ten years as a private student. Interacting with children both as a mother and also as a pediatric health professional for more than 30 years has provided a wealth of experience about how children learn and grow. Deanna is fascinated by how music affects the human brain and how the many different aspects of piano playing can make a positive difference in learning other disciplines such as math and reading. I believe you can achieve a lot with kids if you are kind, even-tempered, and patient. I go out of my way to understand each student's personality. Making a connection between teacher and student helps me help them set their own personal goals. I encourage my students to work hard to develop strength and confidence. These skills are needed in music and in life. I find that students are motivated and inspired when they are valued and cherished as people first. This gives them the freedom to develop and flourish. Victoria was born into an artistic family where her father was an art critic and her mother was an artist. Along with the other arts, she was exposed to music, and at a very early age, she fell in love with music the most. She played many instruments, including flute, piccolo, and guitar, but she always returned to the piano. From the beginning of her adolescence, she knew that she wanted to be a musician. She was fortunate to have many good teachers and was eager to learn from all of them. At the age of 18, Victoria clearly understood that she was passionate about children and their development, so it was very natural to combine this with her love of music and become a music teacher. Being the mother of eight children herself has given her the incredible ability to understand children and their needs. She has a unique way of connecting with each one of them and opening up their horizons with music. Victoria feels lucky to be able to work closely with Tamriko Siprashvili at Inspire Academy and shares her passion and inspiration that help students to achieve musical success. My goals in teaching are to develop both sides of the child's brain in a loving and nurturing environment. Music is a powerful tool to foster logical thinking in tandem with creative expression. Developing both sides of the brain in children is what creates successful and happy people. Most importantly, what brings me the most joy is to plant a seed in children that instills in them the love of music. Debbie was introduced to music at the age of seven. She fell in love with music from the beginning and took her studies seriously because she found that music fed both her analytic side and her creative side. She studied music with some of the best teachers in the Chicago area, including Vladimir Leyetchkiss. She studied at both Valparaiso University and Purdue University. Early in her career she discovered her love of music could be combined with her love for children. She has 35 years of teaching experience, with several of her students becoming teachers themselves. My goal in teaching is to inspire young students to love music through piano. I will work toward giving my students the tools they need to understand how to play the piano and then on working toward using that knowledge to discover their own way of expressing themselves and the music they are playing. Cirilo Cabanlit was born in Manila, Philippines. He studied piano at the University of the Philippines and majored in Piano Performance. He is an experienced piano teacher with over 15 years of teaching children of all ages. He has been a guest organist of the famous Bamboo Organ of the Philippines. Before migrating to the United States, Cirilo taught group piano at Ann Arbor Montessori in Manila for grades one through ten. He also served as the choir accompanist for the school. Cirilo is honored and privileged to be a part of Inspire Academy of Music and Art and to work closely with Tamriko Siprashvili. He is excited to be able to share his passion for music. It is my desire to help my students meet their fullest potential. In order to accomplish this, I consider each of my students and their skill level individually. Then together my students and I can work together to master the skills necessary to reach their goal.I strive to help my students improve their ability and gain confidence through accomplishing their goals. Varvara Milinder was born in St. Petersburg, Russia. She graduated from Rimsky-Korsakov College of Music majoring in Piano Performance. In addition, she also holds a Theater History Degree from St. Petersburg Theater Academy. As a piano teacher Varvara has more than 25 years of experience teaching privately in St. Petersburg, Russia. She teaches all ages from beginning students to adults. To me, music connects with our body, mind and emotion in mysterious ways. A beautiful piece of music can speak profoundly to our hearts. Classical music, especially, transcends language, culture and time. Learning to play a musical instrument well requires focus, discipline, and patience. It fosters expression of thoughts and emotion. These qualities all reflect many of the life skills we want our children to build. My goal is to help students discover the joy of music, improve their own ability, and to gain confidence through their accomplishments. I look forward to being a part of your child's musical journey, just as my teachers have been to mine. Christine was born in Hong Kong. Her mother taught music at an elementary school. She began formal piano lessons at age six. She was involved and was awarded with high achievement by the Associated Board of The Royal Schools of Music. During most of Christine's school years she competed in the annual Hong Kong Schools Music Festival, as solo and duo pianist, and won several awards. She has been under Tamriko Siprashvili's coaching for years. In addition, she is an accomplished accompanist. I believe that each child is a unique individual who needs a secure, caring and stimulating atmosphere in which to nurture their music education. It is my desire to help students meet their fullest potential by providing an environment that is both safe and supports creativity. My teaching style fosters intrinsic motivation and stimulates the passion to learn. My students and I work hard together to master skills necessary to reach goals. For myself teaching provides an opportunity for continual learning and growth. I believe music should always be a part of life. It doesn't have to be your career, but making it part of your everyday routine is important. One of my goals as an educator is to instill a love of learning in my students, as I share my own passion for learning with them. Chiyoko Terada was introduced to the piano at the age of five by Seiko Watanabe. She continued to play and then, as a freshman in Dokkyo University, she added the violin and become part of the university orchestra and the Philharmonic Ensemble Orchestra in Tokyo. At age 22 she graduated with a Bachelor of Law, and continued to study music. In 1992 she was invited to participate in a concert tour in the United States. She traveled with the Philharmonic Ensemble Orchestra and played both in Philadelphia and at Carnegie Hall in New York. She was also invited to participate in a concert tour in Austria and perform at the Wiener Musikverein Hall. In 1999 she moved to the United States with her husband. She soon joined the Oakland Civic Orchestra and the Nova Vista Symphony. In 2004 she became acquainted with Tamriko Siprashvili and soon found that she wanted to share her love for the piano and music. She obtained a certification of Teaching Piano and began teaching privately. Tamriko invited her to join the Inspire team in 2013 where she is currently teaching private piano lessons. In addition to piano, Chiyoko is playing both the viola and violin in local orchestras and string ensembles and continues to work closely with Tamriko. Music continually inspires me. I always seek ways to motivate my students and create opportunities for them to learn. I strive for accuracy and good technique along with developing their creativity. I often remind them of the value of what they are doing; learning to play the piano is something they will take with them for the rest of their lives. Pam fell in love with music at age of 5. After years of classical training she broadened her knowledge to include pop, jazz and film music. She spent many years performing a variety of music professionally. 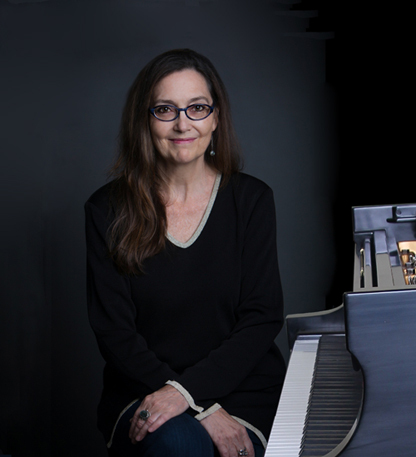 She loves to teach and has taught piano for the last 20 years earning a certificate in piano pedagogy.